OMA is known for its creation of bold new architectural forms — but when it comes to Rijnstraat 8, a government workplace in the Dutch political capital The Hague, the practice was tasked with a sensitive renovation of an existing building, ensuring it was improved and modernised while still staying true to form and context. The building was originally designed by Dutch architect Jan Hoogstad and completed in 1992 to house the Dutch Ministry of Housing, Spatial Planning and the Environment (VROM). Today it is home to the Dutch Ministry of Foreign Affairs, Ministry of Infrastructure and Water Management, the Central Agency for the Reception of Asylum Seekers and the Immigration and Naturalistation Service. The original VROM building was a large rectangular volume comprising a double comb-like floor plan and series of atrium conservatories filling the voids between. ‘It’s a famous building in Dutch architectural history,’ says OMA partner and project lead Ellen van Loon. Although innovative at the time for the attention it paid to sustainability, such standards of environmentally friendly architecture have since risen greatly. A new walkway runs the entire length of the building on each floor, increasing connectivity and enabling a more collaborative atmosphere for the various ministries working there. The top level — the 16th floor — is referred to as the ‘greenhouse’, with its sequence of garden spaces — some with trees bearing fruit, others with sculptural elements — as well as an integration of greenery into working areas. The entrance lobby, curiously, was originally on the 4th floor; now, it’s on the ground floor, along with a public restaurant, both easily accessed from the public space under the building. This now forms the base of a 5-level semi-public section of the building preceding the offices above. These floors — home to a cafe, employee restaurant, meeting rooms, congress centre facilities, dramatic foreign ministry meeting room and spacious communal areas — are accessible to all government ministry staff as well as invited guests. ‘We didn’t want it to feel like a fortress,’ van Loon says. These semi-public floors boast a sleek black-and-white aesthetic inherited from the original interior design, enhanced by OMA with features such as the newly designed black-and-white striped carpet. Nevertheless the floors are connected by a highly successful burst of colour: neon-yellow escalators link one level to the next, not only bringing a positive hue into the mix but also improving wayfinding. 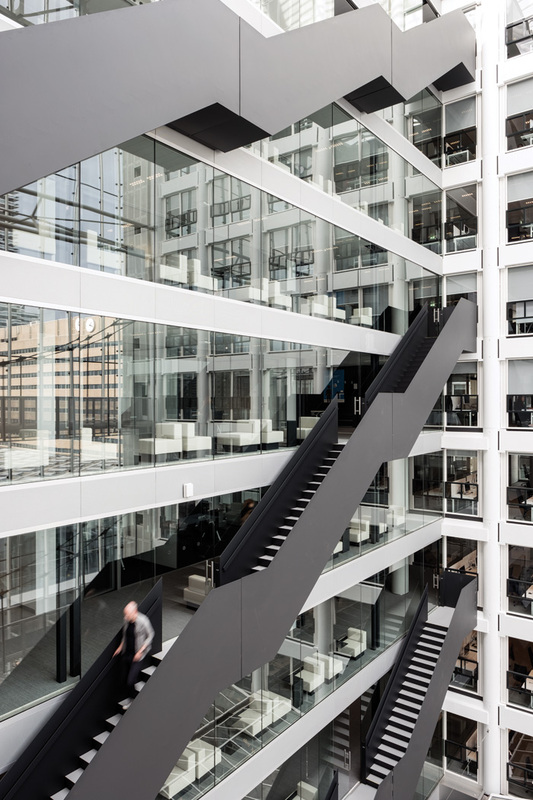 The monochrome palette continues in the office spaces above, with the most striking elements the black single-plate steel staircases connecting the floors and exposed black structural beams that were previously hidden. 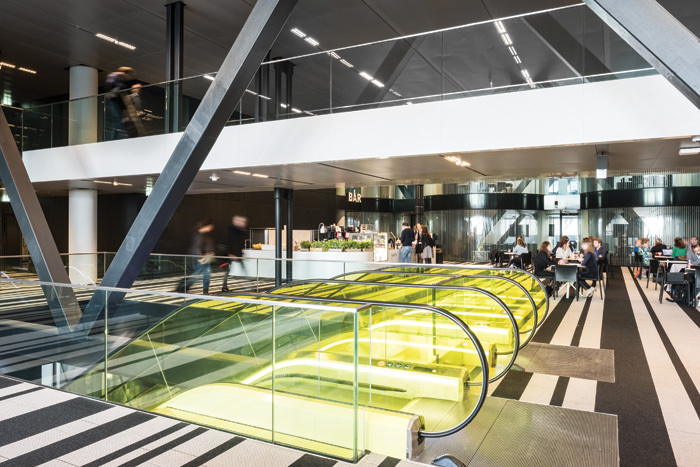 OMA undertook the project alongside constructor BAM and facility services provider ISS as part of a Public Private Partnership named PoortCentraal. It worked within a restrained budget and a tight, two-year timescale. Of the 20 per cent of the building that was demolished, 99.7 per cent of building materials have been reused. The project has significantly reduced energy consumption through using triple glass in the atria, solar power, LED lighting, the transformation of organic waste into biogas, a system of warm/cold air storage and cooling ceilings using low-temperature water rather than ventilation. But it is not just the interior that OMA sought to improve. The pedestrian walkway under the building — connecting the city’s main train station to the town centre and its cluster of government buildings — had, over the years, become an increasingly crowded artery of movement. OMA dramatically doubled the space by widening it, enhancing pedestrian capacity as well as critical public space in a location surrounded by busy roads. This new public space — created, says van Loon, ‘to give something back to the city’ — hosts public seating, greenery, cycle parking and a new artwork by Tamar Frank. And the vision doesn’t stop within the site boundaries. The transformation of Rijnstraat 8 marks the beginning of a series of OMA projects in The Hague — van Loon is also the lead architect for the renovation of the Second House of Parliament.